On March 2nd, 2011, the U.S. Consumer Product Safety Commission in cooperation with Burlington Coat Factory, placed a voluntary recall on their Bella 5-quart slow cookers. About 7,460 of these slow cookers were distributed through Burlington Coat Factory and sold at their stores nationwide from June 2010 through December 2010 for about $20. 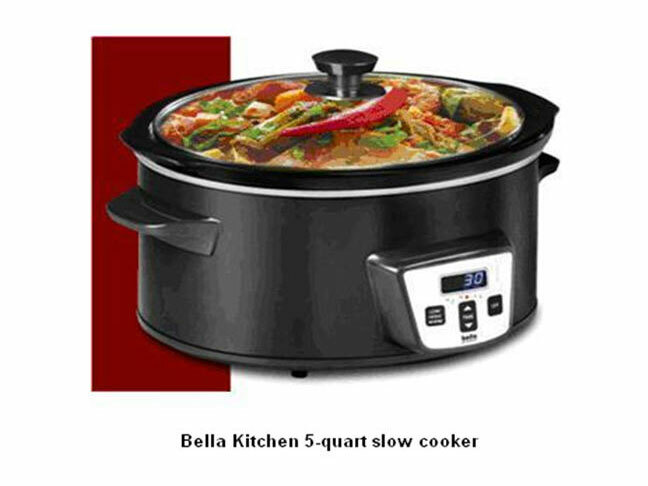 This recall involves Bella Kitchen 5-quart programmable slow cookers. The slow cookers are black with "Bella Kitchen" printed on the control panel. Only slow cookers with model number WJ-5000DE and date codes 0907 or 0909 are included in this recall. The model number and the four-digit date code are printed on a label on the underside of the product. The slow cooker's control panel can overheat and melt, posing a fire hazard. The manufacturer has received 60 reports of the control panels smoking, melting and sparking, and three reports of panels catching fire. Fourteen incidents resulted in minor damage to countertops. No injuries have been reported to date. What should you do if you own or have purchased one of these recalled products? Consumers should stop using the slow cooker immediately, unplug it and return the slow cooker to Burlington Coat Factory for a full refund or store credit. For additional information, contact Burlington Coat Factory toll-free at (888) 223-2628 between 8:30 a.m. and 6 p.m. ET Monday through Friday or visit the firm's website. Additional information can also be found at the CPSC website.